I have been working on my "Sampler Stocking" for the past couple of days. I'm determined to get it finished up soon. Well, I'll be looking forward to sleeping in for the next few days. It's been a rough week. Matthew caught a cold and hasn't been sleeping well. He's finally getting over it, so it should be a good weekend. Write soon! Nicole, I absolute love, love your stocking. I hope that you finish it soon. It's great! And I love that quilt from the Harvest Home book too! Hope Matthew is feeling better soon! the stocking looks real close...is it?!?!! It is sure pretty! You are such a fast stitcher!!! I hope Matthew feels lots better real soon & doesn't share with his siblings!!! I cant wait to see your finished stocking!! I havent touched mine in months, cant decide if I want to restart with silks or continue with the dmc. Guess I better get Frederika done first, lol. Oops ~ Hope Matthew gets well soon! The stocking is wonderful! Those colors are great. Your stocking looks fabulous! Can't wait to see it finished. I like that quilt. :) The fabric is so pretty. Hope Matthew is feeling better. After stitching my first CHS stocking (Truth & Virtue), I've decided it definitely won't be my last. Your sampler stocking is fabulous. Those reds just POP! Guess I'd better add that one to my list. This stocking is amazing!! Fabulous! Your stocking is SO pretty, Nicole. You can't have much more to do other than making it into the stocking itself, right? It looks so nice. The quilt book--gasp. I love the cover quilt, too! I hope Matthew is feeling better soon! Enjoy your 'lie in', as they'd say here! Your stocking is looking so pretty! 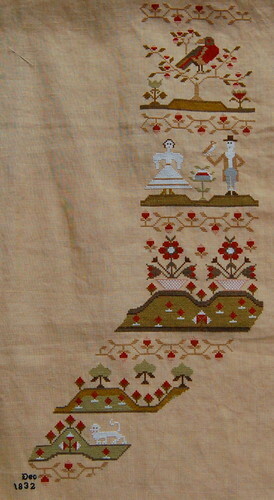 And that quilt looks like it will be so pretty too. 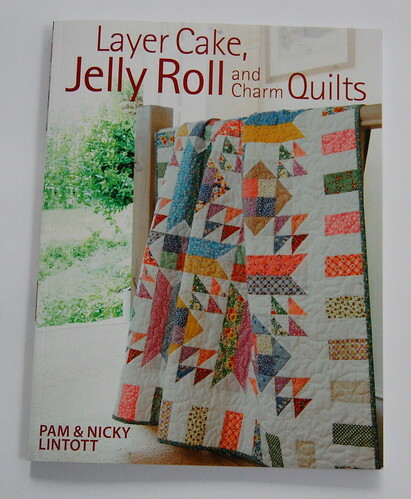 Don't you love all these patterns that are out for jelly rolls and layer cakes and charm packs, etc.? So handy! Hope Matthew is all better so you can both get some sleep! Love your stocking Nicole! Keep going! I love those colors! I just bought my daughter a layer cake and jelly roll quilt pattern and fabric...I love it! I guess I really need to make a quilt for hubby and I and I love your choice! Hope you have a great weekend and that Matthew is up and going! the stocking is looking great! love the quilt too, you have way more patience than i do to start that as well. LOL hope everyone is feeling better soon. Your stocking is goegeous!!!!!! The colors are amazing!!!! Hi! It's been a while since I checked up on you..and you've been really burning the candle at both ends, dear friend!! Everything looks awesome. You're so near finishing the stocking..it looks fabulous. I visited Jess and Kellan and had a wonderful time...he called me, "UmMa" !! I was thrilled! Wow Nicole your stocking is really pretty!! I saw Siobhan's finished Shores of Hawk Run Hollow and it has totally inspired me to work on mine so it looks like it has been a Carriage House Samplings week for us both. 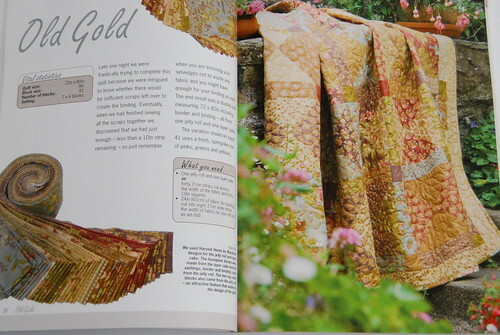 The quilting book looks wonderful!! I hope Matthew is doing much better!! Hope you get to relax and sleep!! Wow, the stocking is really nice! OMG...Nicole. I have to stitch that stocking now that I've seen yours. Hope your little one is feeling better. Very nice progress on the stocking and that quilt is beautiful. I had a peek at the book in my local library, so many beautiful projects. I saw your pictures in flickr....and I thought wowzers...soon this will be done and in the tub too! LOL! 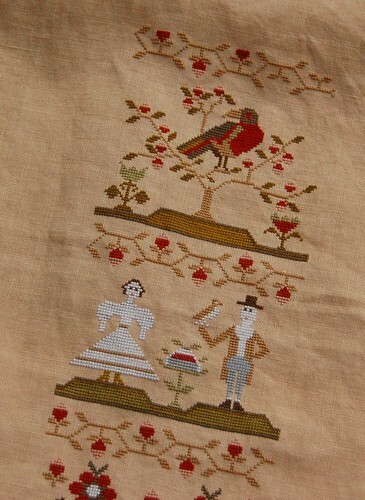 I admired your blog, your crossstitch works and your photos! With admiration fills some sights. Congratulations! I marked you, than reader. Please visit onto my blog, and I ask you if you consider it worthy one mark it than constant reader.